An overnight curfew is in effect for all towns in Atlantic County, except for Atlantic City. Emergency Management officials instituted the curfew in the wake of widespread power outages in South Jersey. The curfew will remain in effect until 6 a.m. Sunday, at which time officials will reevaluate their "game plan", so to speak. Meanwhile, Governor Chris Christie held a news conference at the Atlantic County Office of Emergency Management Saturday afternoon, and according to reports, the governor is calling in the National Guard to bring in generators and water to impacted areas. Atlantic City casinos do have power, the governor says. Also according to reports, power may not be restored until at least July 4th for the majority of Atlantic City Electric customers. Food and water are available to residents today from 5:30 to 7;30 at the community center at 5045 English Creek Avenue in Egg Harbor Township, Galloway Township Middle School at 100 South Reeds Road in Galloway and at St. Bernadette's Church at 1421 New Road in Northfield. 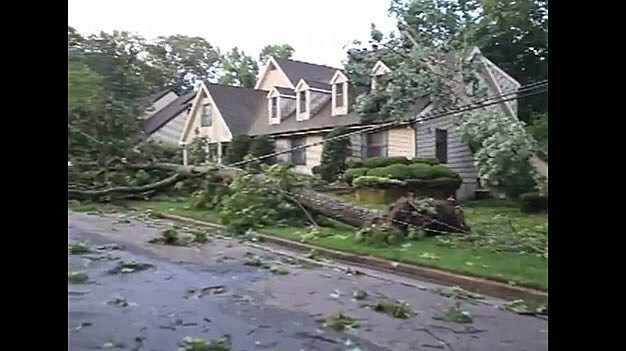 Residents with damage are urged to contact their local Office of Emergency Management. An emergency hotline has also been established to provide updates - call 1-866-704-4636.